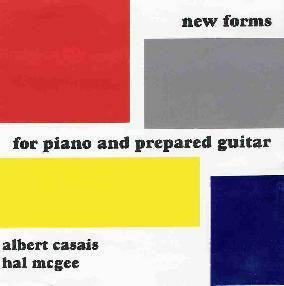 Albert Casais & Hal McGee - "New Forms for Piano and Prepared Guitar"
I've noticed Hal McGee using piano quite a bit on his recordings of the past year or so, and this new duo release with Albert Casais brings Hal's interests in the instrument to the forefront. Which makes this in some ways very different from any of his previous recordings on which Hal has made a name for himself in avant-garde sound-art circles. But here we have Hal playing away on a traditional acoustic instrument, and doing quite nicely if I may say so. His part isn't all necessarily avant-garde either. Sure, there's dissonance and a large measure of exploration. But there's plenty of pleasing melodies as well, and Hal transitions comfortably through a variety melodic themes, styles and moods. I particularly like the maddened concert pianist style that he's incorporated into a few of his other recent projects. I've never heard of guitarist Albert Casais but a quick internet search revealed that he records under the project name Omnid. Albert plays in a free-improv style that concentrates on the sounds and percussives that result from various string manipulation techniques. With Hal handling the melody and "musical" aspect of the recording, Albert adds the avant-garde sonics to produce an interesting and enjoyable combination. I'd be very interested in playing this album for a traditional orchestra fan and see their reaction. On the one hand, there's a high degree of accessibility to the music. On the other you have Albert's jagged sound creations that are sometimes quietly but busily working away and other times wrenching and intense. But it's the combination of piano and guitar, which are occupying such radically different worlds, yet seeming to travel so comfortably in the same space, that really held my interest and attention for an hour. Much to enjoy here for avant-garde free-improv fans, and definitely recommended to seasoned Hal fans who are open to hearing him doing something different. Email Albert Casais at: omnid@optonline.net. Contact via snail mail c/o Haltapes; 1909E SW 42 Way; Gainesville, FL 32607, or to Albert Casais; 94 Prospect Ave; Bayonne, NJ 07002.